Warburton is a town on the Yarra River 60 km east of Melbourne, surrounded by foothills of the Great Dividing Range. In late 1859 gold was discovered in the Warburton area, at Britannia Creek west of Warburton and at Scotchman's and Yankee Jim's Creeks. A settlement called Yankee Jim's (named after a gold discoverer), was formed on the creek. When an important lead was found in 1863 the name was changed to Warburton, after Police Magistrate Charles Warburton Carr. As the gold began to run out mines moved northwards to the Yarra River flats and a new Warburton was formed. It was named Upper Warburton to distinguish it from Old Warburton on Yankee Jim's Creek. 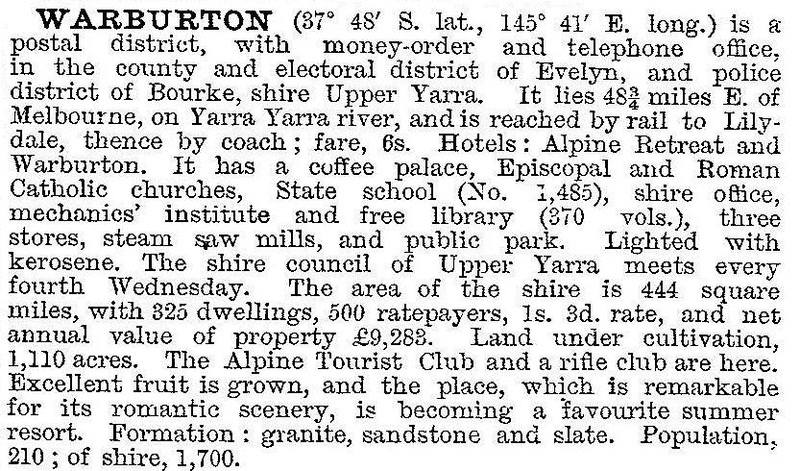 On 19 October 1888, the Upper Yarra shire of 911 sq km was proclaimed with Warburton as the administrative centre. In 1890 a Methodist church was built in Warburton. 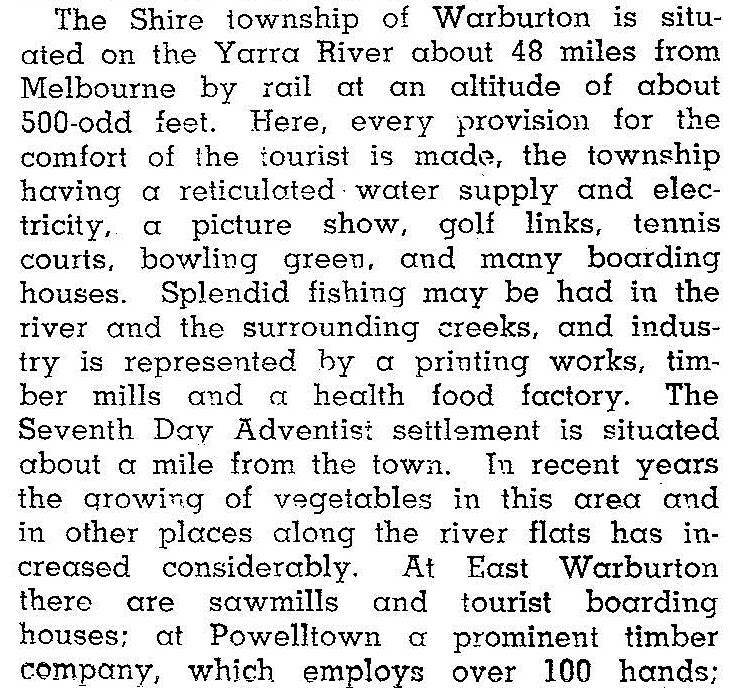 In 1894 the Warburton Village Settlement west of Warburton, was established. It consisted of numerous small farms, inspired by the Anglican Reverend Horace Tucker who persuaded the Government to pass a Village Settlement Act. The settlement became Wesburn. In 1906 the Seventh Day Adventist church established a community at Wonwondah, 1 km east of Warburton. Their school attracted about 90 pupils of whom half were local children. Warburton had two aspects which the Adventists wanted – a clean environment (in keeping with their avoidance of alcohol and tobacco) and copious water flow in local streams to power their printing works for the production of religious literature. They established the Signs Printing Company building and workers' cottages and shortly afterwards opened a sanitarium and health-food factory, the forerunner of the Sanitarium Health Food Company (1925). The present Sanitarium and Signs buildings (1936-39) are heritage-registered. 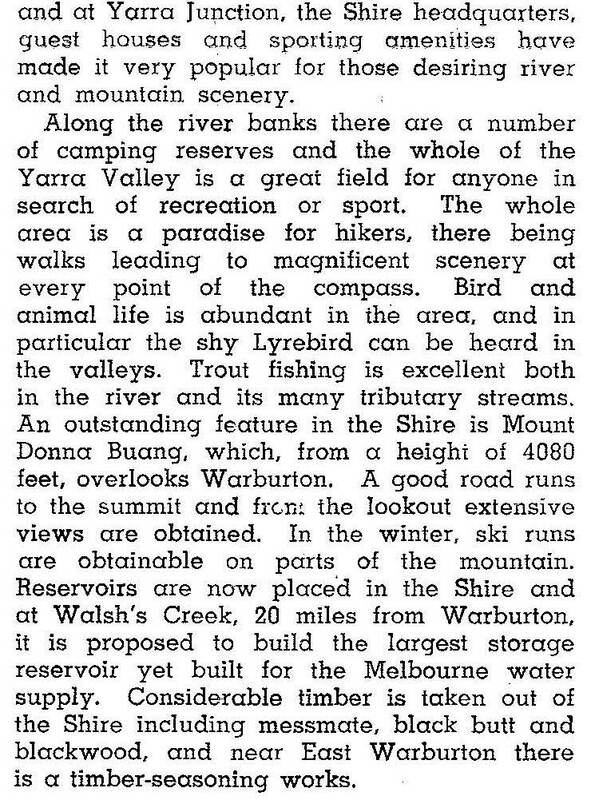 In 1912 a bridle track to the Mount Donna Buang snow resort was opened and widened to 2 metres in 1924 by the Ski Club of Victoria. By the mid-1920s 12 hotels and guest houses were in Warburton, including the ‘Mountain Grand’ of 50 rooms offering the best wines and cigars as well as petrol for motorists. Hire car services were also available, and a trout hatchery restocked the streams with fish. Accommodation reached new heights in 1927 with the opening of The Chalet, with space for 280 guests. It was destroyed by fire in 1973. Further along the Woods Point Road the settlement of East Warburton opened its first school in 1886. The locality was opened up during the building of the Upper Yarra Dam in the 1950s. It has a primary school and a hall. Postwar Warburton underwent steady if unspectacular growth. A higher elementary school (1953) opened and a Olympic swimming pool in 1969. (The Upper Yarra High School, however, opened in Yarra Junction in 1961). There was a surrender to the motor car age when the railway line from Lilydale was closed on 13 December 1964. Warburton's role in the cultural life of the Upper Yarra shire was enhanced with the opening of the Civic Arts Centre in 1980, becoming the venue for annual Easter film festivals. The Warburton strip shopping area is the service centre for its immediate region; no significant centre exists eastwards in the Yarra Valley and the nearest competitor downstream is Yarra Junction. The strip has about 50 premises, mostly retail, but is constrained by a floodplain to the north and the railway reserve on the south. The 1980s and 1990s witnessed a greater consciousness of history and preservation in the community. In 1988, the shire's centenary, the centenary trail along the former railway line was opened. The following year saw the first Old Time Festival, and the Winterfest began in 1991. The Warburton Bridges and River Walk Track was opened in 1993. Warburton has bed and breakfast accommodation and health resorts, a golf course, extensive walking trails, a visitor information centre and a caravan park. It is adjoined by Millgrove and Wesburn to the west and by East Warburton which reaches to the Yarra State Forest. The whole Warburton urban area is about 8 km from west to east. From the mid-2000s a number of major developments transformed Warburton. The Edgewater Resort and Spa is an expansive development including an apartment hotel incorporating an adaptive reuse of the original heritage listed Sanitarium Health Foods Weetbix factory. The resort incorporates residential clusters along the river. In addition, a greenfields site on Martyrs Road, adjoining the town's golf course was also developed.